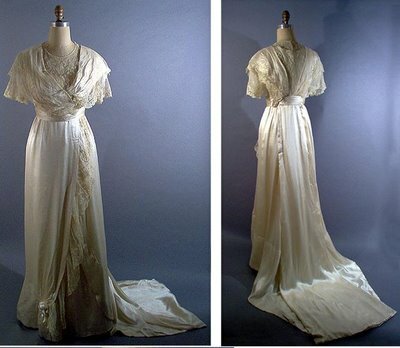 My wedding gown is a late Edwardian style dress and instead of making a split-front skirt with a faux overdress, I opted to make my dress into two pieces, so essentially I have two gowns – one for the ceremony and then one for the reception, with two different looks. I used Butterick 4890 to make my overdress, which is a Renaissance style gown. The overdress is basically a robe. 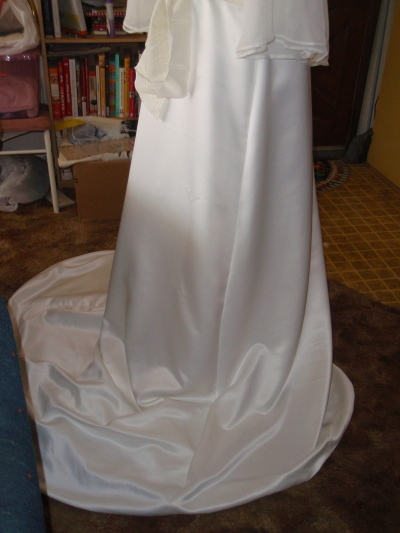 I made a muslin first, just to see how long the train is and how the pattern fit over my underdress. 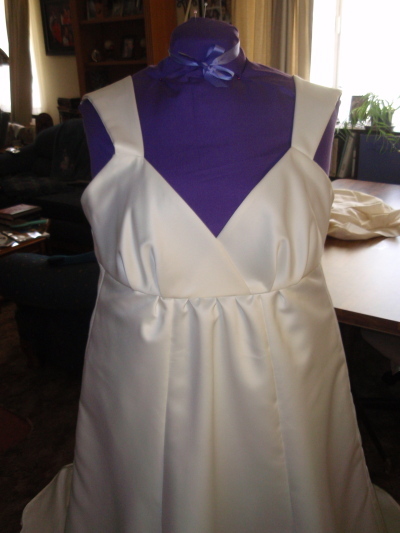 At first, I made this dress out of ivory satin tafetta, as I thought that I’d like the contrast of colors and fabrics, but after I made it, I found that I really did NOT like it. 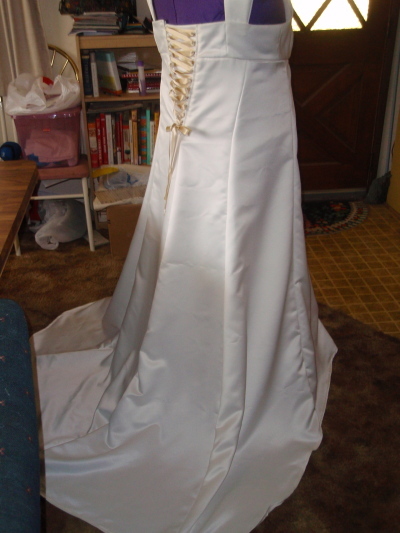 So, I decided to make another one out of the ivory peau de soie satin of my underdress and found that I really loved it. My underdress is a fusion of Butterick 5325 and Butterick 5461. I used B5325 (a fitted a-line wedding dress pattern) for the skirt, but altered it by raising the skirt fabric and creating an empire waist, gathering the fabric in the front. I found that the original fitted dress was a little too close fitting and it showed the hooks on my corset, so I wanted a little bit more looseness. The bodice is B5461 (a multi-pattern bridesmaid dress pattern) as I wasn’t very happy with the strapless bodice on the original pattern, even when I added sleeves. 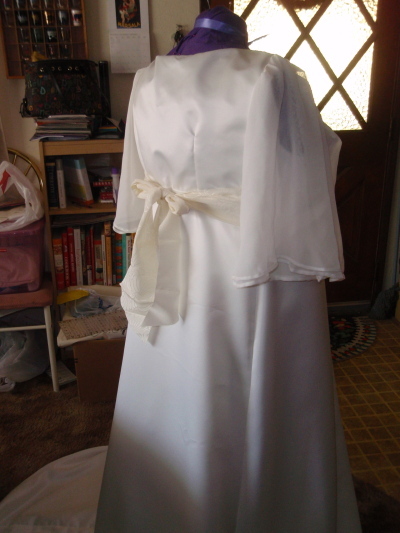 I used ivory peau de soie heavy satin with cotton voile lining for the skirt and satin lining for the bodice. 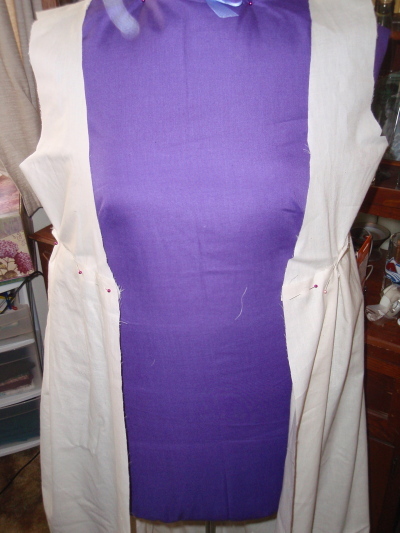 The cotton voile is very light and airy and breathable, but I didn’t think that it worked as well for the bodice, so I opted for a heavier lining. My underdress has kind of a 1930’s feel. 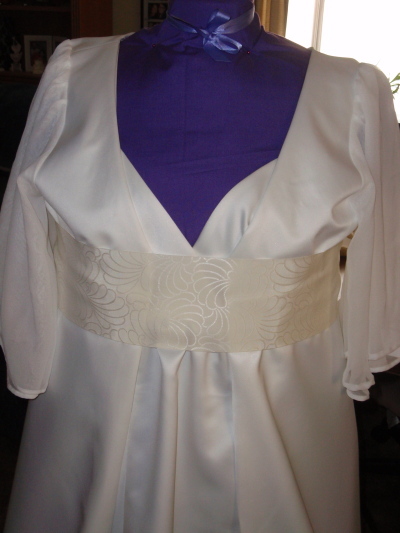 I plan to finish the underdress with silk chiffon rosettes on the neckline and embroidery on the center panel. There will also be an alencon lace modesty panel on the center bodice as it currently shows my bra. 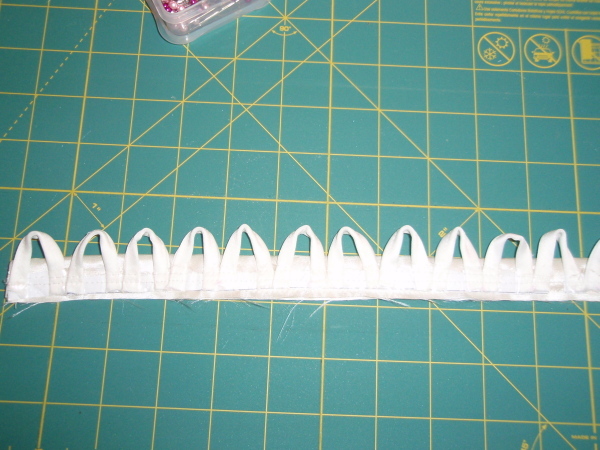 I will also be adding alencon lace trim to hem of the skirt. I made flowy flutter sleeves for my overdress with an old pattern (McCalls 4305) that my future mother-in-law had. The original sleeve pattern is a split sleeve, but by putting them together, it gave me the sleeve that I wanted. The sleeves are ivory silk chiffon. For now I am just using the ribbon off of my grandmothers’ wedding dress around the waist, but we’re going to make a silk chiffon cummerbund for the waist with a satin ribbon flowing down the back. 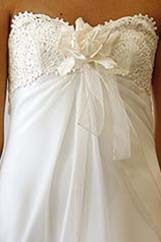 I will be adding silk chiffon rosettes to the train and probably on the back waist above the ribbon. 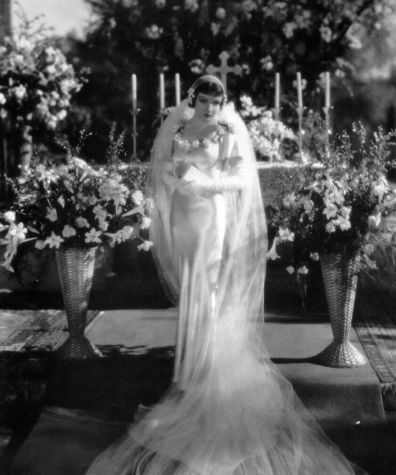 Claudette Colbert in "It Happened One Night"
I love the rosettes and the simplicity of this 1930’s bias cut satin dress. 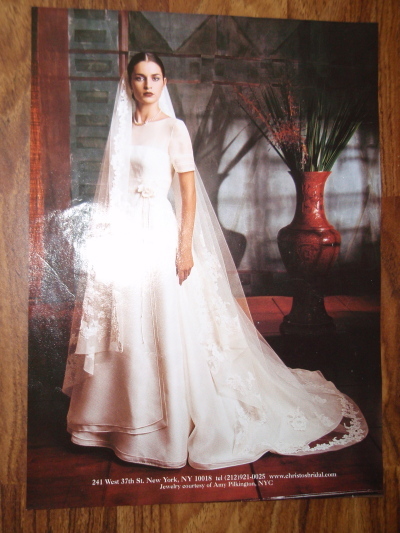 I fell in love with the sleeves on this gorgeous Renaissance style gown. This Christos gown I snagged out of a bridal magazine from the early 2000’s was one of the first gowns I ever fell in love with. 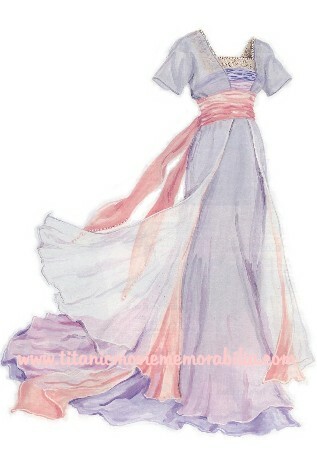 I wish I knew the name of this dress, but it’s long out of the collection, so no chance getting it. Claire Pettibone is my favorite wedding gown designer and I love all of the vintage details she uses. And of course there is Rose’s swimdress which is pure Edwardian elegance and is the style that I wanted to evoke in my wedding gown. The next steps are the finishing alterations and the embellishments! The fun parts!!! Wow – it looks fabulous!!! GREAT job!! I love your inspriation and then the actual creation. So beautiful. I too love Rose’s swim dress ultra feminine. Wow, beautiful, so far! I am hoping to do the same thing, but with a different kind of dress. 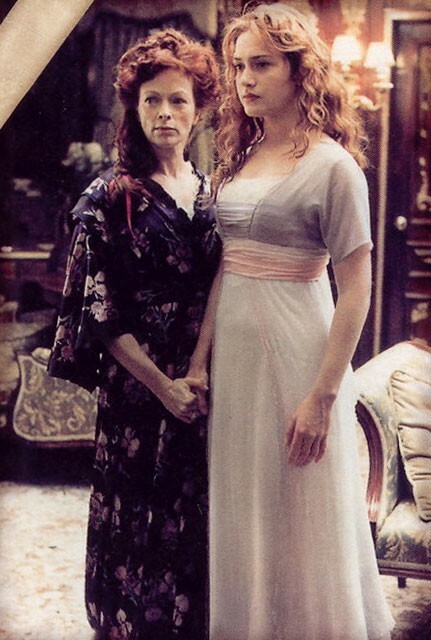 My fiance and I have set a date for 5-10-15, and I have an idea of a wedding dress picked which is the “Dinner”dress from Titanic, but white and instead of the pink underlayer, yellow. I am hoping to have it altered so that the tatoo I am having done on my right shoulder will be visible. Any ideas?